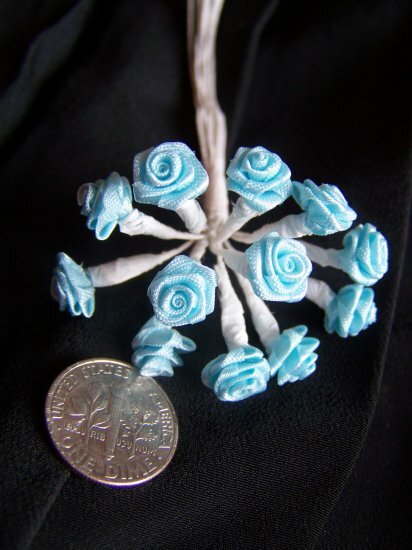 New 144 ribbon roses with white wire stems. Roses are 3/8". Each bundle of roses have 12 and there are 12 of those in a package for a total of 144 roses. I have the following colors listed separately: Soft yellow, peach, red, baby blue, mauve, aqua/teal and I have a limited supply of the rolled baby blue roses with the pearl stamen and lace wrapped roses. >> NOTE The picture with the teal with the blue to show the color difference. Tea/aqua is on the right. Measurements; Rose heads are 3/8" wide and stems are all white and range from 3 - 5" for the overall length from rose to end of stem. S & H to the USA is $2.50 first class, each additional rose pkg of 144 is $1.00 or less. International: Paypal only. Ask for your countries shipping price. **I do combine shipping to save you shopping dollars! I have over 12,000 new and vintage sewing, knitting, crochet and plastic canvas patterns in stock!